Why Apple? All those reasons you never bought a Mac, not true anymore. How much time have you spent troubleshooting your PC? Imagine a computer designed by people who hate to waste time as much as you do. Where all the hardware and software just works, and works well together. Get a Mac and get your life back. 2. You can make amazing stuff. Every Mac comes with iLife ’06, a suite of software that transforms your photos, music, and video into all kinds of projects. Make high-quality websites, photo books, DVDs, songs, slideshows, music CDs, calendars, cards, prints, podcasts, music videos, documentaries, and more. 3. Design that turns heads. You won’t want to hide your Mac in a corner of the den. You’ll want it front and center in your life. The Apple style shows in every detail, from its sculpted surfaces to its gorgeous Mac OS X graphics. 4. 114,000 Viruses? Not on a Mac. Mac OS X was designed with security in mind. Windows just wasn’t built to bear the onslaught of attacks it suffers every day. A Mac offers a built-in firewall, doesn’t advertise its existence on the Net, and isn’t compromised within an hour of being turned on. 5. Next year’s OS today. Since Mac OS X engineers aren’t busy damming a flood of viruses, they have the time to think up amazing new technology. Like Dashboard widgets, mini-applications offering a world of capabilities just a keystroke away. Or a built-in RSS news reader. 6. The latest Intel chips. Intel Core Duo processors put you on the cutting edge. In fact, a Mac with an Intel chip is so fast it surprises even longtime Windows pundits, who keep running benchmarks again and again. Results? Fast. Fast. Yup, still fast. Setting up a video chat with the people next door — or across the globe — should be as simple as picking up the phone. On a Mac, you just click an icon to have a four-way video chat in a full-screen window with amazing clarity and special effects. 8. More fun with photos. On a Mac, you don’t need any extra software to make a photo book. You don’t have to leave your photo software to visit a separate website and wait for forms to load. All you need is a camera and a Mac. How long does it take to post a photo or video to your blog on a PC? On a Mac, you can shoot a picture or a movie with the built-in camera, then post it on the web in a few clicks. Pontificate, preachify, and publish. The hardest part is coming up with something to say. Want to get your message out to the world? Podcast it. A Mac makes it simple to create professional podcasts, complete with artwork. Add sound effects and jingles, even use the built-in radio engineer to make it perfect. So you can be a talk star in seconds. Musicians get all the girls (or guys). And a Mac has the software to turn you into the musician of your dreams. Choose from hundreds of cool riffs and instruments to create your own songs. Get good enough and you could be on iTunes. Connect your DV camera and turn your movies into spectaculars. Add graphics, titles, and sound effects in minutes. Then use your Mac to burn a DVD or post to your website. 13. No hunting for drivers. Just plug in your stuff. 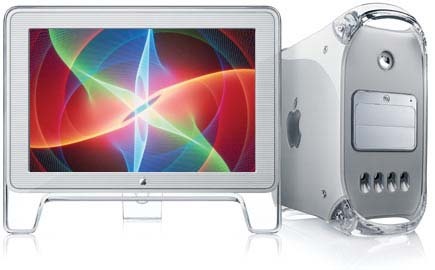 A Mac includes USB drivers for mass storage, digital cameras, input devices, iPod, and more. It can see Bluetooth cell phones and headsets, as well as FireWire cameras. No rebooting. 14. Awesome out of the box. Other computers include software, it’s true. But once you start using that software, you find that you’re hobbled in some way or another. Software included with the Mac, on the other hand, is critically acclaimed as best in class. 1. Know iTunes? You know the Mac. You’ll recognize features like library collection, playlist arrangemen t, and instant search in many Mac programs. So you’re something of a Mac expert already. 2. You can take it with you. A Mac can open most of your files with the right software. Most popular applications for Mac and PC use the same file formats, making it simple to exchange documents with coworkers or move existing files from a PC to a Mac. 3. Yes, Macs run Microsoft Office. Microsoft Office for Mac OS X gives you Word, PowerPoint, and Excel, all with familiar features and the same shortcut commands. And when you need to use it for collaborative work, Office for Mac connects to Microsoft Exchange servers. 4. No, Macs aren’t slow. The latest Intel Core Duo processors put other chips to shame. And a Mac just loves that second core, since Mac OS X has known about multiple processors from the start. Try burning a DVD while watching a TV show on iTunes. 5. No, you dont have to buy new stuff. Your printer, camera, keyboard, and mouse will work with a Mac. PCs and Macs can usually share peripherals if they connect via USB, FireWire, or Bluetooth, three industry standards built into every new Mac. 6. Yes, you can even run Windows. So you have to run just that one thing, or maybe your office requires it. No PC? No problem. New software helps the latest Intel-based Macs run Windows applications.